A Practical Excel Training Course designed for You. Excel from Beginners to Expert level - UK Certified - Live Chat Support as you Study. Excel Courses designed for You. Since 2009, between our instructor led and online Excel courses, we have trained over 100,00 people in the UK & Ireland. From these years of experience , our team of trainers have created a practical Excel course designed for you to succeed in your job. Available for individuals and companies , our online excel course concentrates on the essential Excel concepts, techniques, functions & formulas that are needed to succeed in the real world office environment. The course contain four Excel levels: Beginners, Intermediate, advanced and pivot tables. You will get 10 hours of high definition videos with a practice workbook for each lesson and live chat support from our Excel tutors as you study. This Excel course mixes essential Excel theory with practical examples of real life Excel tasks and calculations. Our Online Excel course covers Excel from absolute Beginners up to Expert Level. 1. You can replay each video lesson again and again. 2. Download practice workbook for every video lesson. 3. Get instant support from our Excel Tutors on our Live Chat Support as you study. 4. Study what you need for your job as our course covers Microsoft Excel completely. 5. Login anytime on your laptop, tablet or phone 24/7. 6. Includes repeatable online tests: Download your Excel certificates immediately. 7. Recognised by major UK Professional bodies. 12 CPD Points. 8. Keeps track of your course progress. 9. Covers all Excel versions 2007, 2010 ,2013 and 2016. The whole course contains 10 hours of video lessons. Allowing for two hours of practice for each hour of Video, you should master the whole course in about 32 hours. Repeatable online Exams available at end of each level to get your Certificates. 4 CPD points per level if required by your professional institute. Employers, increase your employees productivity with our online Excel course. 1. You can track the progress of your staff in real time from your desktop. 2. 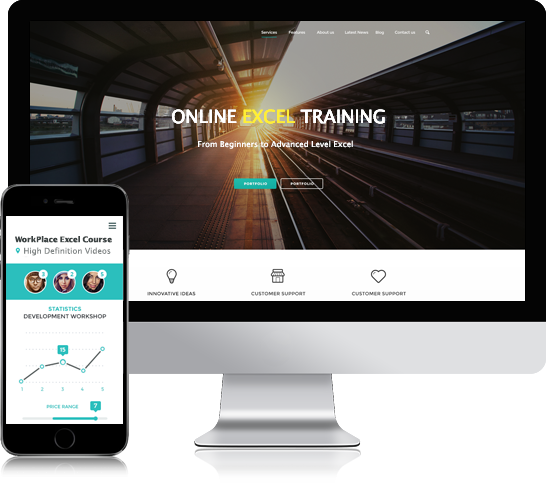 Suitable for all your staff as our course covers Excel from beginners to Advanced levels . 3. Each employee gets their own unique login. 4. Full expert email and live chat support as they study the course. 5. All Login accounts and group administrator accounts set up for you. 6. Our Course is Web based so No IT integration required. 7. You can test your employees progress with online assessments for each level. Certificates of completion and CPD points available. In this Sample lesson from our course, you will learn about the very important and useful Excel function called the COUNTIF Function. Learn how to build and use it with some great examples of the function in use in real life situations. In the course itself , you will be able to download the practice worksheet for this lesson and practice all that you have learnt. This five minute video will give you a quick overview of our online Excel course. Learn about the four different Excel Levels and the topics available for each one. Note the practice spreadsheets available for each lesson, the four different certification levels and learn how to use the course to its maximum. See the full course syllabus here.